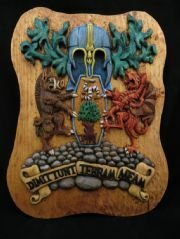 Primley Wood Carving & Knotted Jewellery is the creation of myself (Viv Heard) and my long term partner (Pete Charters). We both have a passion for hand made quality products. 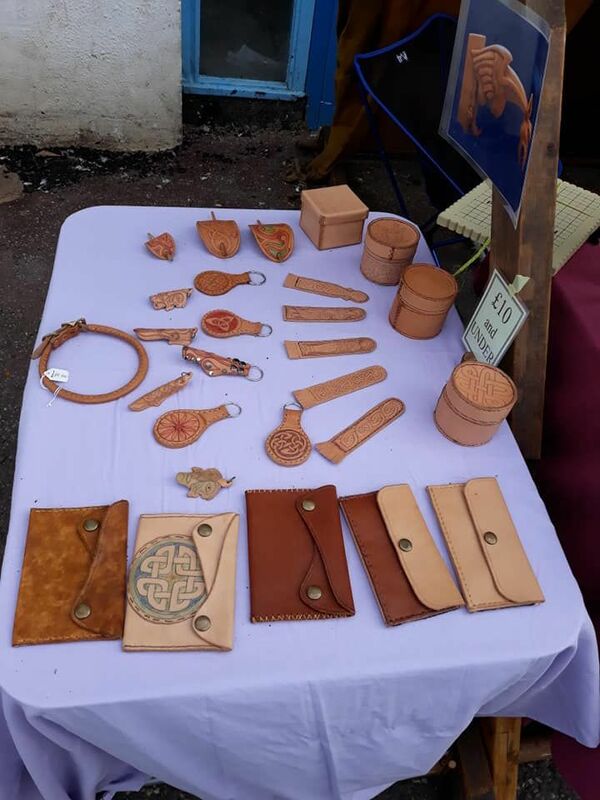 Pete is an accomplished wood carver and leather worker and I make knotted jewellery. We are based in Devon and sell at local markets around our area as well as from the website. All of the wood used for the carvings comes from sustainable sources. We started by getting wood from a local woods where we used to walk our little dog Jeb (sadly missed) and now take Todd, which is managed by a local wildlife trust. We now purchase wood from a range of sources and this has broadened the scope of wood types available. 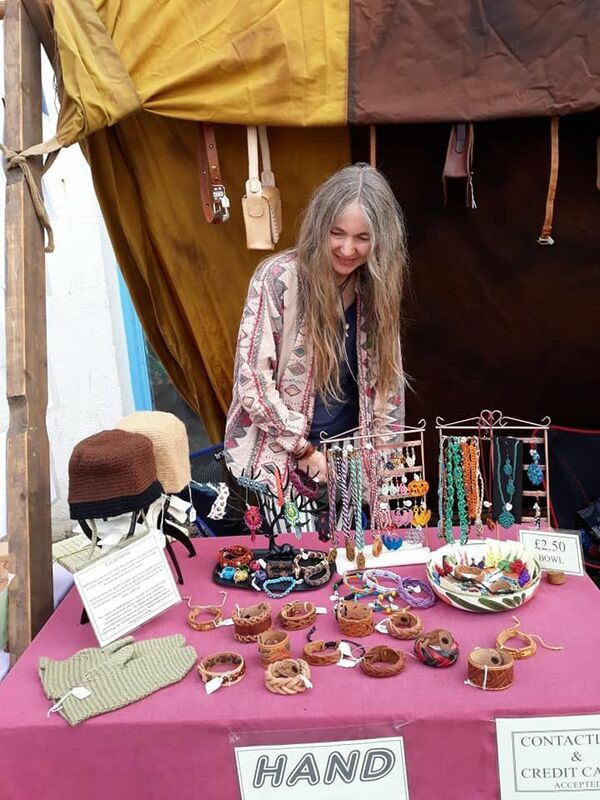 Most of the cord used in the knotted jewellery is cotton or leather, but some products are available in hemp for the more eco minded customer. Pete started as a traditional sign writer (everything designed and painted by hand) and progressed into wood carving a number of years ago. 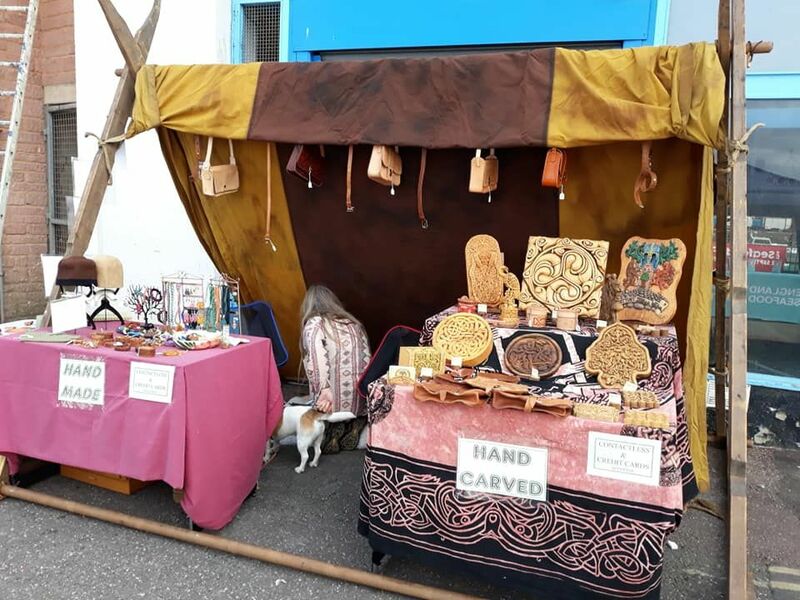 He specialises in Celtic designs as he feels an affinity to that culture, but is flexible and can turn his hand to many styles of art. 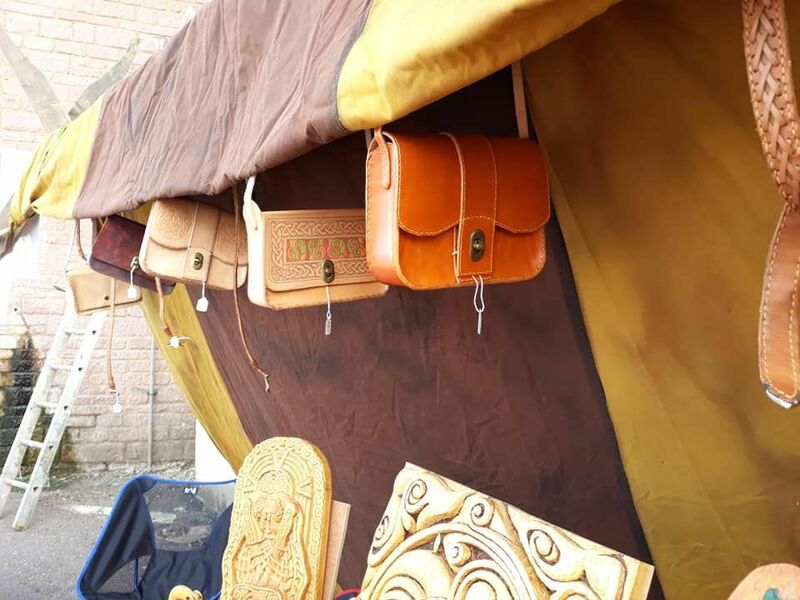 He started working with leather in 2017 and seems to have a natural flair for this too. He now makes a broad range of products. 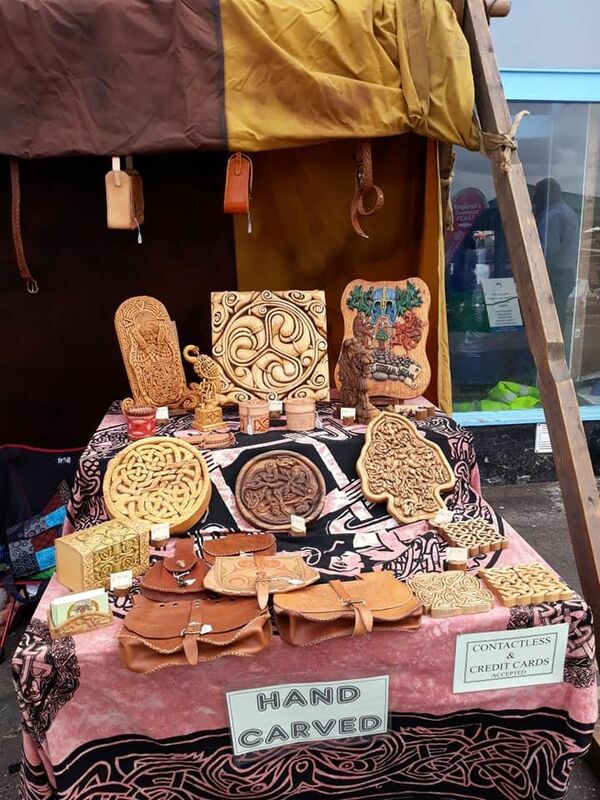 He sometimes uses a technique called Pyrography which is scorching or burning with a tool that resembles a soldering iron and reaches very high temperatures, it can be used to highlight detail or to draw a design onto wood or leather. He feels strongly about maintaining and continuing ancient and heritage crafts which is shown in his choice of work. Pete cutting planks. At a small market in Totnes 2012 Carving tree from tree! Working on his bench. My Mum introduced me to tatting (which she can do) rather late in life and I got on so well she decided to give me another challenge, and suggested knotting (which she can't do!). Knotting, as the name implies, is using combinations of different types of knots to create pieces of jewellery or decoration. 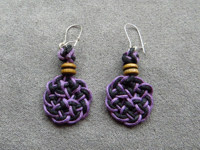 It is also known as micro macrame. I make all of the jewellery for our site but I also deal with all other aspects of the business, from managing the website to packing and dispatching orders, and all of the admin type stuff so will probably be your point of contact should you phone or email us. Thanks to Dave Ellacott without whose help we would not have been able to start this adventure. Thanks to Bruce Barber for sharing his knowledge and skills. And acknowledgements to George Bain, Aidan Meehan and J Romilly Allen whose books have been a help and inspiration. Thank you to our lovely niece for modelling some of my jewellery for me. And finally thank you to my Mum for getting me started with the knotting.